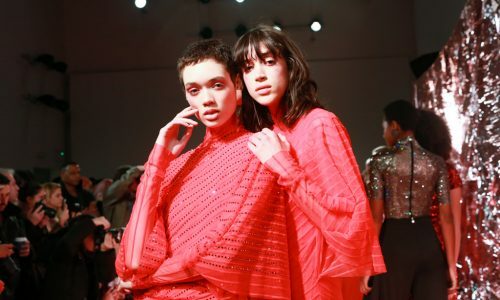 Crowds gathered in excess outside the Skylight at Moynihan Station in New York City on a balmy Monday night to see the return of Anniesa Hasibuan to New York Fashion Week. 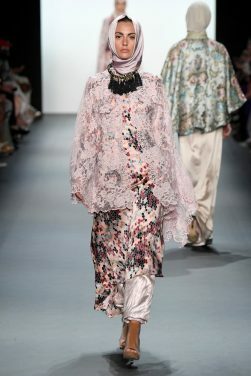 The Jakarta-based designer is known for her unique women’s evening wear, which combines classic techniques, Indonesian inspiration, with a distinct Muslim tradition. 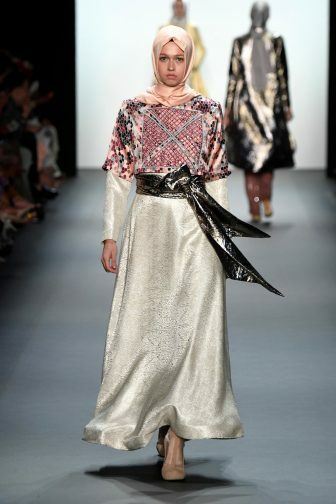 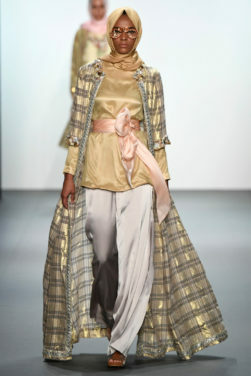 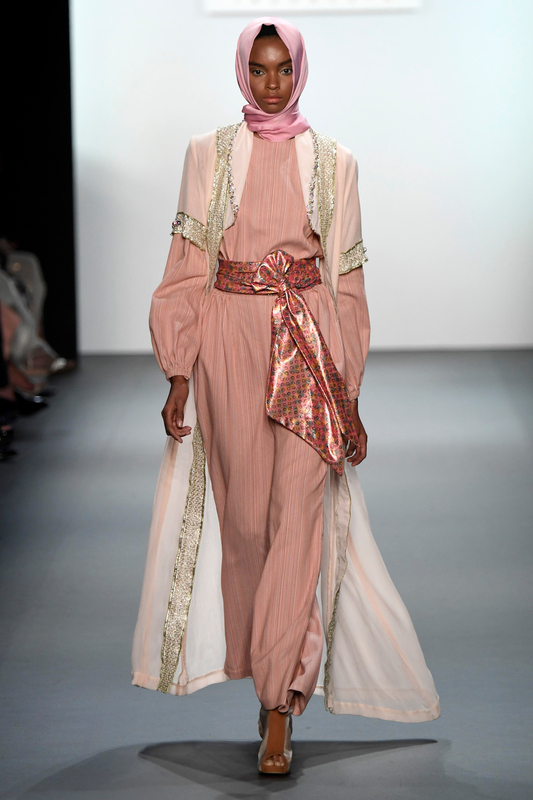 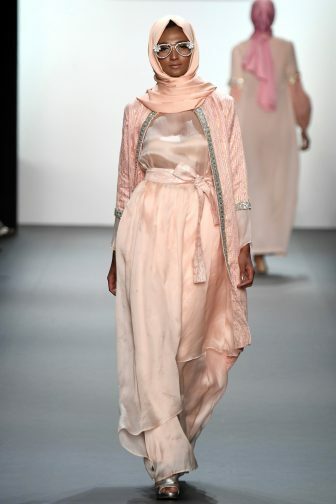 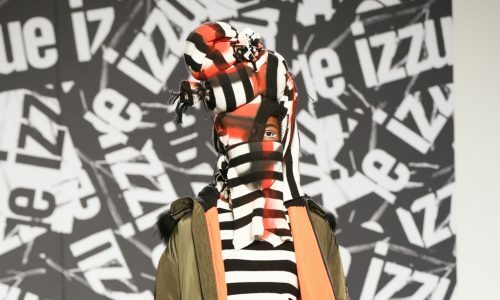 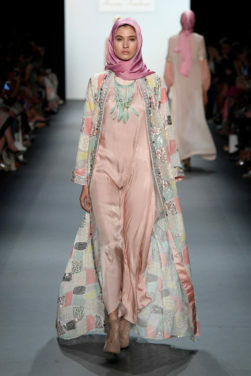 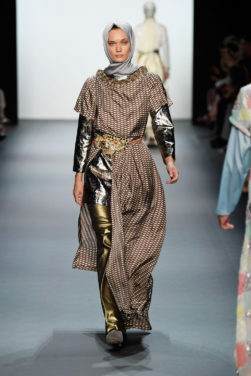 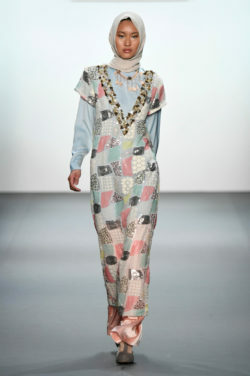 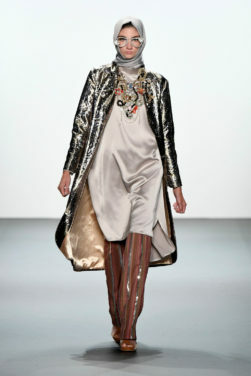 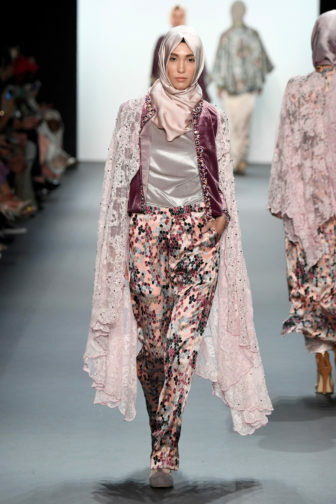 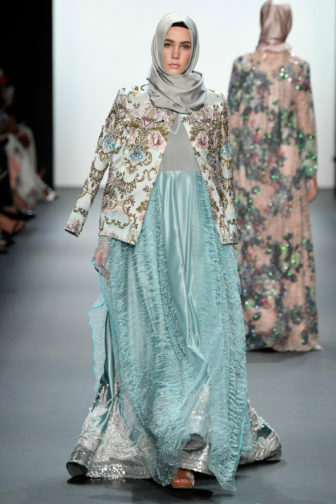 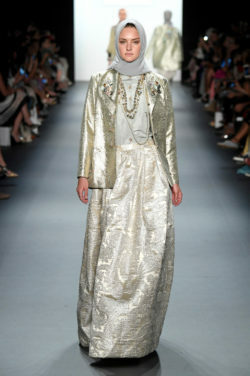 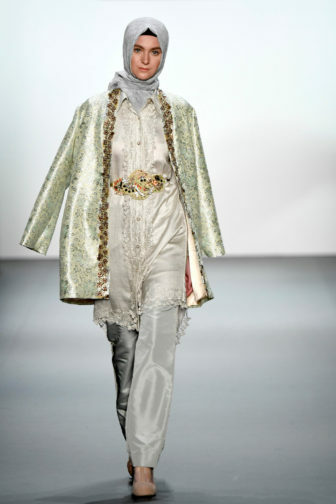 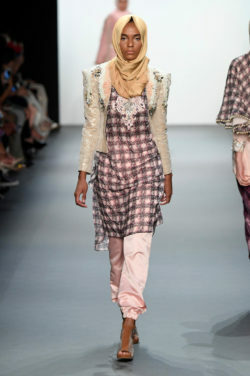 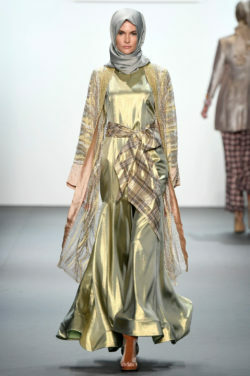 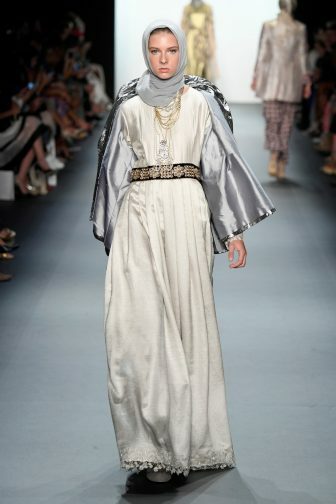 Updating the Hijab with crystal-crusted eyewear, pajama pants and chic layering, Anniesa took the headscarf and made it a high-fashion runway mainstay. 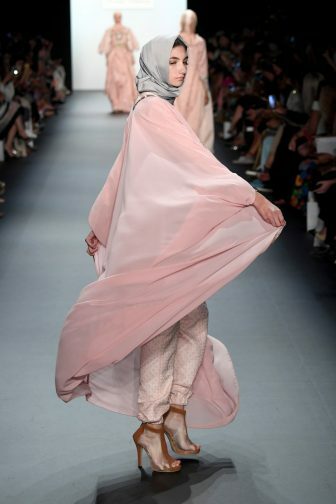 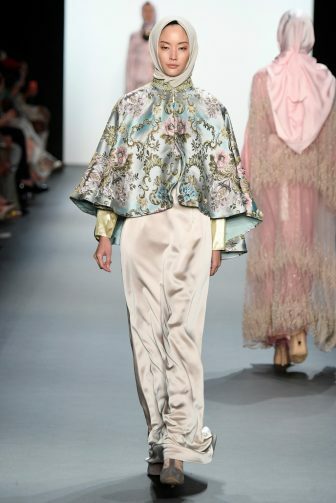 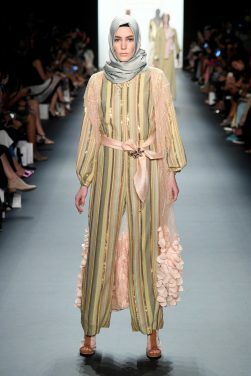 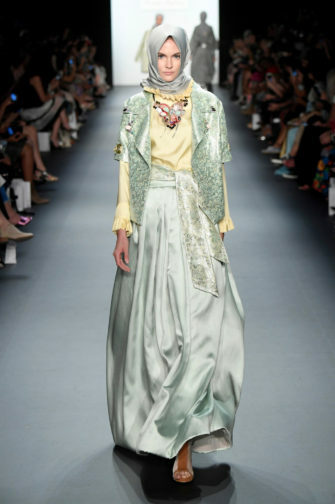 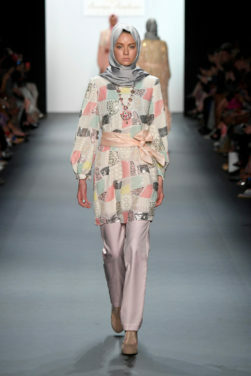 A vast expanse of muted pastels was the base for the collection. 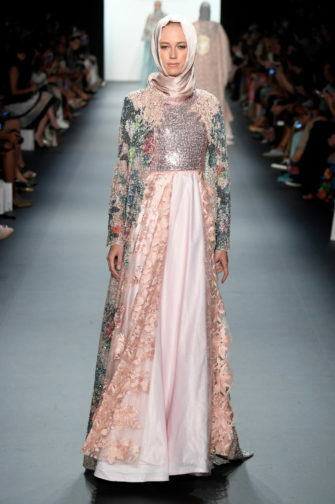 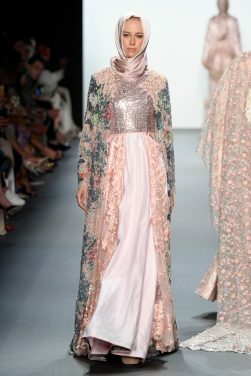 Dusty pinks, moss, and lilac silks were prevalent as the primary hues for her designs, and then diversified with rich metallics. 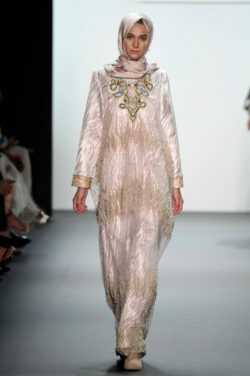 Embellishments of crystal, pearl, gold, and silver made each piece sparkle with light. 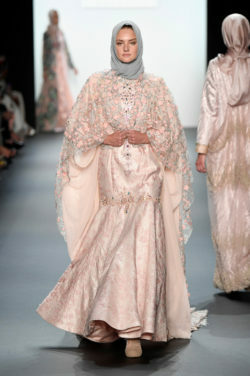 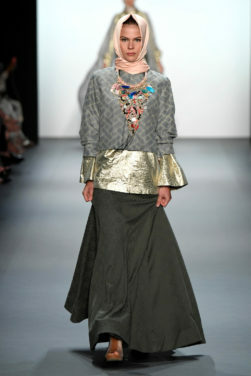 Intricate beadwork on capes and skirts yielded a weighted texture to the otherwise light and flowy garments. 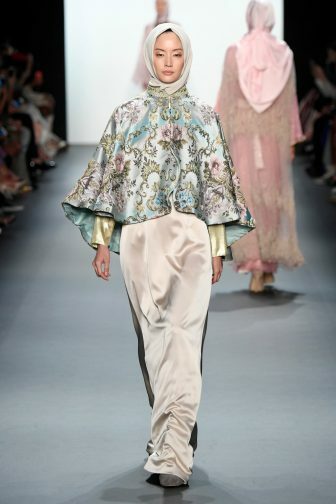 Silk caftans and robes were layered in many ensembles, several of which had extended trains that caught the air with stunning movement and draping. 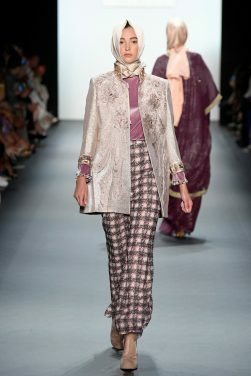 Silk pajama pants paired with heels modernised the otherwise customary aesthetics. 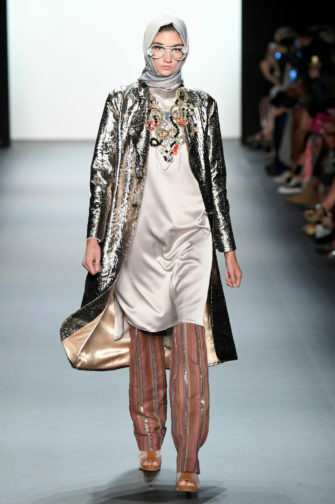 An intricately beaded white leather jacket was almost blindingly luminescent while tailored silk taffeta blazers brought an updated and more linear feel to the collection. 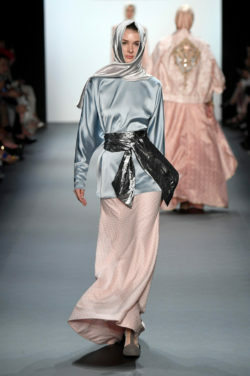 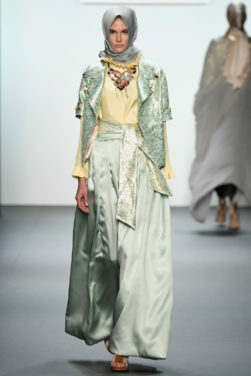 A standout piece was an impeccably tailored cropped seafoam satin jacket with an almost gravity-defying peplum bustle. 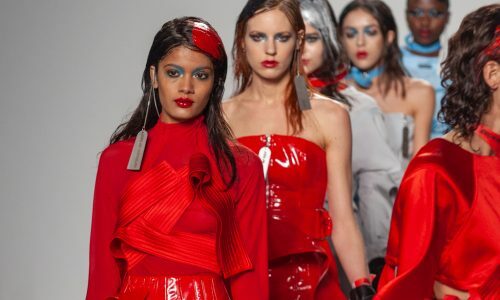 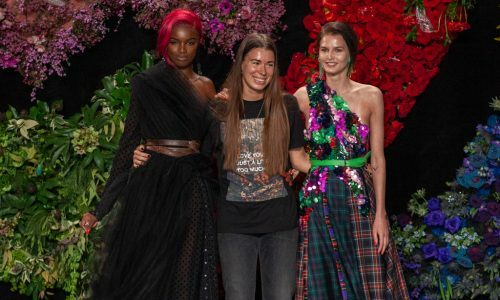 The show completed its circulation with a number of multi-layered jewel-laden pieces in an brighter array of colours than previously showed, and lights dimmed. 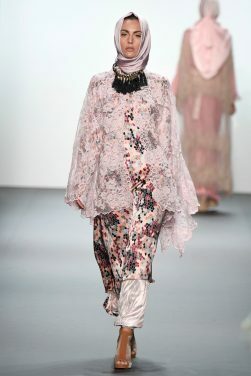 The shaded figure of the model in Anniesa’s final look made her way to the centre of the top of the runway in silhouette, two assistants in tow to fan out her train. 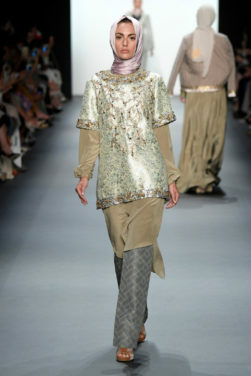 The light came back up to the audible excitement of the spectators. 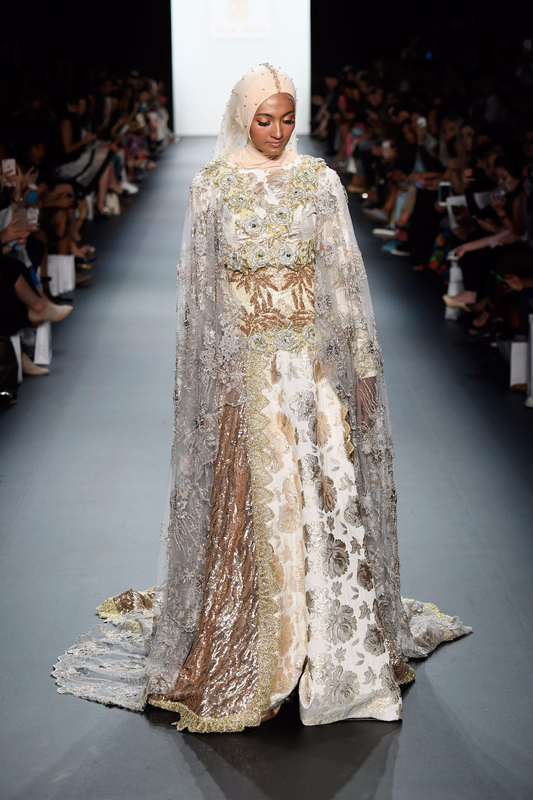 The model walked forward, arms outstretched to greet her adoring public in an elaborate, gold-trimmed white gown complete with pearl studded veil. 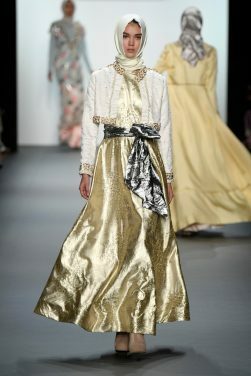 Her extended walk effused the true wealth and expanse of the collection. 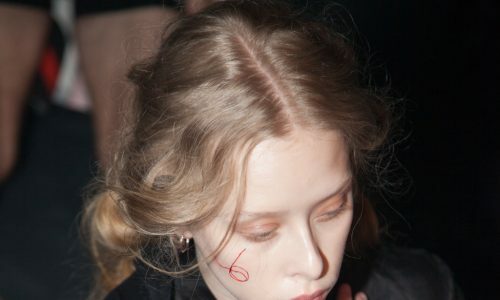 An assistant was spotted backstage crying with relief. 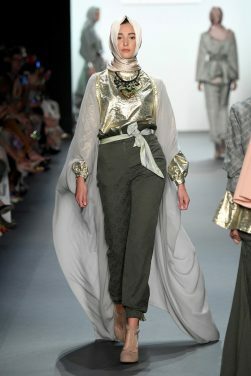 The visual impact of Anniesa’s show was truly felt as she made her way down the length of the runway. 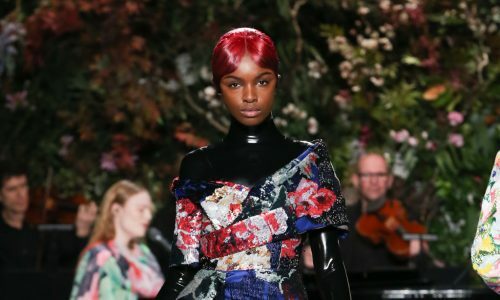 The collection truly worthy of the crowds extended cheering. 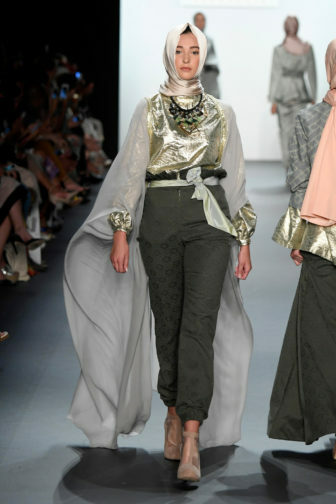 Making the headscarf an accessible and wearable feature in this collection brought together what was once perceived as two different worlds. 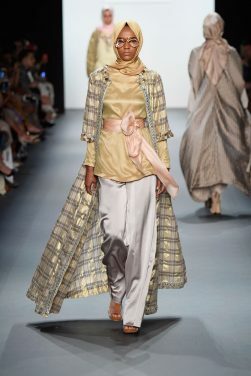 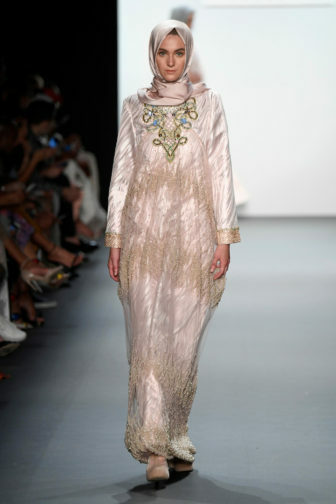 Western glamour blended with Muslim tradition and Indonesian ethnic flair truly made worlds come together, complete with pearls, silk and gold. 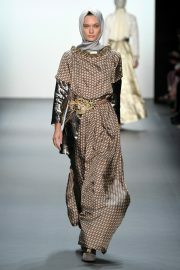 For further information about Anniesa Hasibuan visit here.